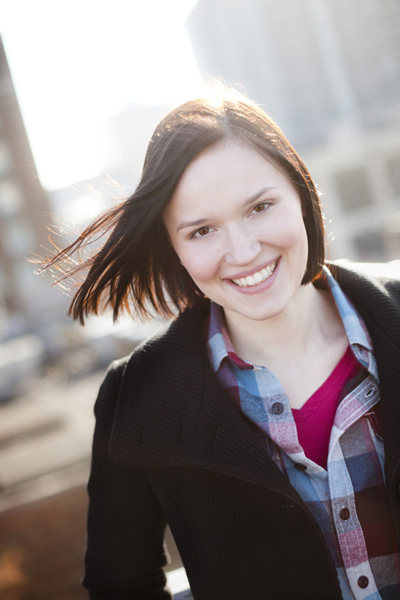 YA author Veronica Roth sets her books in Chicago. Today I chat with the local author of the smash Divergent trilogy, a set of dystopian young adult books set in our very own fair city. Divergent was a New York Times bestseller, while the second book in the series, Insurgent, was released last week. Like me, Roth is a Northwestern graduate and like me, she’ll be appearing on a YA panel at Printer’s Row this summer, so stay tuned for more information about that! You start your Insurgent tour this summer: how do you typically decide what to read for appearances? Insurgent is so full of spoilers that the range of scenes I can read from is pretty narrow. That said, I try to keep in mind that listening is a much different experience than reading—some of my favorite scenes don&apos;t come across as well when I read them out loud. So I try to choose one that is a little more action-packed, or has a little more humor, if possible. And, you know, trial and error is always a good policy. How is plotting out a series different from plotting out a book? I don&apos;t really outline—I wrote an outline for book two, but spent all my drafting time working to mentally discard it. So the difficult part of writing a series is that you continually write yourself into corners and have to write yourself back out again. For example, if I kill someone and I find in the next book that they would have been useful, I&apos;m out of luck. Most of the time I&apos;m able to make it work, but sometimes I get a little scared that it won&apos;t. The best part about writing this way, though, is that each thing I write builds on what came before, so it&apos;s a process of discovery for me right alongside the reader. I know that if something surprises me, it will also surprise them, in all likelihood. The other difference is that you&apos;re working with two arcs– the larger arc of the series, and the smaller arc of whatever book you&apos;re writing. That means that you have to find a way to have a (somewhat) satisfying ending, while still leaving room for the next book. You have to answer some questions and leave some questions dangling. You have to figure out what has to happen to a character in the meantime in order to lead them where you ultimately want them to go. It&apos;s sort of like watching a television show with a greater series arc– every episode contributes to the finale, but every episode has its own story. What are some of your favorite literary series? Most of the series I read are under the young adult umbrella—Harry Potter, the Chronicles of Narnia, the Animorphs (oh, the childhood memories), and more recently, The Girl of Fire and Thorns, which is the first book in what I think will eventually be a trilogy by Rae Carson. What’s the update on the film adaptations of your books? I sold film rights to Summit Entertainment last year, and a production company, Red Wagon, and a screenwriter, Evan Daugherty, also signed on after that. Now Summit is a part of Lionsgate, but everything is proceeding as it was before—just waiting for a screenplay and we&apos;ll see how it goes from there. Between writing, editing, promoting and all the other parts that have come so far from Insurgent and Divergent, what have been the most difficult moments for you? Have there been any hurdles where you thought, “I’m not sure I can do this, or do this right”? I think every writer has a little voice in his or her head that critiques them as they write, stifling their creativity, so the most difficult part is writing the next book while people are reacting to the last one. I don&apos;t read reviews, but I still hear a lot of feedback. Most people only approach me with good feedback, which is better for my sanity, but still tricky! And that can be difficult, because each piece of feedback creates another voice. It was hard enough for me to suppress that one voice of my internal editor, let alone the many that have cropped up since Divergent came out. I still haven&apos;t figured out how to make them all shut up and let me write, dammit! I am hopefully getting better at that as I go. What are some of the most useful lessons you’ve ever learned from your writing teachers? What’s the most frivolous thing you’ve purchased with your advance money? Forty bags of marshmallows. I made a promise on my blog that I would jump into a pool of marshmallows if my book sold, and since I didn&apos;t have a pool, I filled a bathtub with them instead. It was hilarious and messy. And surprisingly cheap. You give a lot of writing advice on your website. What about writing/publishing are you still trying to figure out? Oh, everything. Sometimes I feel like a fraud, providing writing advice when I have so much to learn. But I try to post what I&apos;ve learned so far, almost as I&apos;m learning it, in case it hits someone else right where they are, too. Sometimes I contradict myself once I&apos;ve learned more and I&apos;m okay with that. I struggle most with improving the actual writing itself without a teacher and a class, neither of which I can seek out right now. Soon, I hope! I clean. Seriously, you can tell when I&apos;m trying to avoid doing something because my apartment becomes spotless. As a married person, do you believe having a happy home life helps or hinders the creative process? Some people find success writing in the midst of turmoil, but I&apos;m not one of those people. I have trouble writing unless I feel relatively at peace, both with myself and the people around me. It&apos;s like I have to feel safe before I can put my characters in danger. What book have you read and loved lately? I loved The Fault In Our Stars by John Green. It struck a good balance between emotion and humor, and it made me very thoughtful for several days, which is a sign of a good book, for me. How are you best equipped to survive a dystopian post-apocalyptic future? I&apos;ve watched enough zombie movies to know strategy. I&apos;d go to the nearest CostCo, pick up a sledgehammer, and get on the roof. Unless there was fire raining from the sky, or something. In that case, I would run to Lake Michigan. See what I mean? I have PLANS. What about Chicago makes for a good literary setting? I love Chicago. I love it more than any other city. I even love how painfully, disgustingly cold it gets. For me, that makes it a great setting. It&apos;s also an interesting city for a dystopian setting because it&apos;s so clean and organized, compared to a place like New York or Los Angeles—imagining it abandoned and crumbling and destroyed is incredibly interesting. I also find something particularly interesting about the “L”— how almost omnipresent it is, and how constant it is. I love trains generally, but the “L” is spectacular. What’s your favorite "L" line/route? How does it feel to be the 313th person interviewed for Zulkey.com? It feels fantastic. And a little bit dirty, somehow.